In recent months a debate has been brewing around whether shortform or longform content is winning the race for people’s attention. No doubt there are merits to both sides, but there seems to be some confusion abound the subject. For clarity, longform means articles, white papers and e-books of 2,000 words or more, while shortform refers to content of 500 to 1,000 words. Is there really a difference in their overall performances? Science suggests there is. Many of today’s Internet marketers swear by shortform content, citing a number of independent studies that indicate audience attention spans are falling and as much as 32 percent of users will begin abandoning websites in as little as five seconds if they are slow to load. This doesn’t speak to the effectiveness of the format in reaching its audience in terms of visibility and findability through search. This is one of the most important advantages that longform content has over its counterpart. Search engine algorithms favor rich content that occupies the upper echelon where word counts are concerned, as do the habits of social media users in an environment oversaturated with bite-sized and intentionally misleading – read clickbait – info-bits. According to recent findings from SerpIQ, longform content ranks higher in search and allows brands to establish themselves more firmly in the minds of potential consumers belonging to their target demographic. Even here, success varies by degrees as the relationship between the average content length and ranking position follow a bell curve, with articles closer to 2,500 outperforming those nearer 2,000 words. Building a successful website or blog is about more than reaching a benchmark threshold and calling it a day. For longer works to have any impact on your conversion rates and traffic, they must be optimized for the Web. This is the perfect time to use long-tail keywords and broaden your SEO practices to encompass images as well. By incorporating visual content into articles of high word counts, you’ll be making things more scannable and therefore more appealing to readers who are time-deficient. In this way, the negative associations that longform content has had attached to it by certain circles is negated and its biggest perceived drawback falls flat on its face. With 23 percent of people’s time dedicated to reading blogs and trawling social media sites for such content, you can’t afford to not give your audience what they want – and what they want is detailed, informative and well-researched reading material. 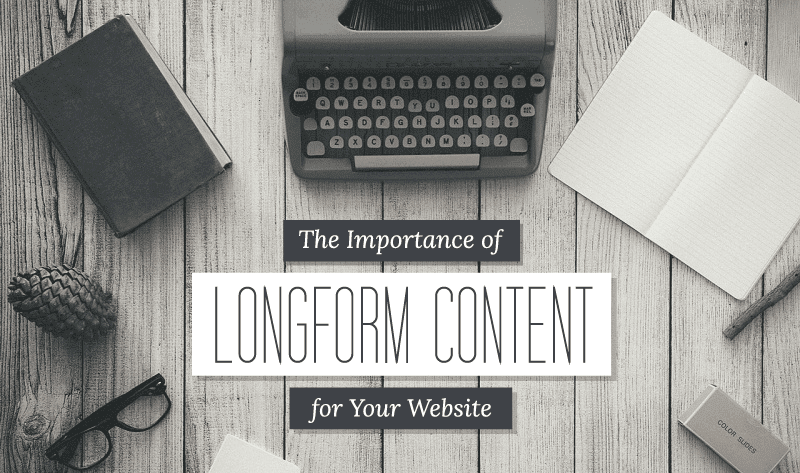 Let’s take a look at real examples of longform content. MySammy – 101 Ways to Increase Productivity At Work. This is a pretty small productivity blog. It doesn’t have the best design to it and looks rather old. And yet, their huge productivity article showed up very high in search results. They listed one hundred and one tips with expansive explanations and pictures to go with it. It looks like it took a lot of time, but worth it for the traffic they got from people like me who had never heard of them before. DrSnooze – What Is the Best Mattress for Back Pain? Let’s take a look at how this can work for retail or ecommerce. This one is another found on Google, from a small mattress store in Florida. Again, not a huge nationally known company, but still able to rank high in search results. The added charts are a nice touch to break up the long informative text. All in all, it’s good practice to create a mix in your marketing and promotional strategies to have all your bases covered. Just don’t prioritize the short-term rewards of shortform content ahead of the rewards offered by longer material. The next time you come to writing anything directed at your online audience, give some thought to how it will be displayed and structured over 2,000 words or more. If you can do that, good things are sure to follow and your business will be poised to benefit. Scott Huntington is a writer from Harrisburg, PA. Follow him on Twitter at @SMHuntington.